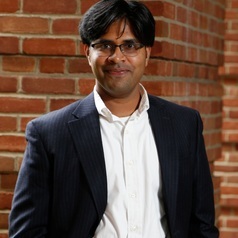 Dr. Aravind Chandrasekaran is an Associate Professor in Management Sciences at the Fisher College of Business. Dr. Chandrasekaran’s research investigates innovation, learning and knowledge creation issues in a variety of areas including high-tech R&D, manufacturing and health-care delivery. In recent years, he has begun to study the challenges involved in developing patient-centric healthcare models by working with several physician and nursing leaders. As an example, his recent research work in collaboration with over 40 healthcare providers involved radically redesigning the discharge process for transplant recipients at a large medical center. This multi-year project has resulted in substantial reduction in patient readmissions, reduction in cost, improved patient perception of quality of care and empowerment of frontline care providers. His research has been published or forthcoming in Management Science, Manufacturing & Service Operations Management (MSOM), the Journal of Operations Management, Production and Operations Management, Journal of Surgical Research and Harvard Business Review. His research has won several awards including the 2012 INFORMS-Industry Studies Best Paper Award, 2013 Carol J. Latta Emerging Leadership Award for Outstanding Early Career Scholar by the Decision Sciences Institute and 2015 Pace Setters Award for Research.